Dante has a home! 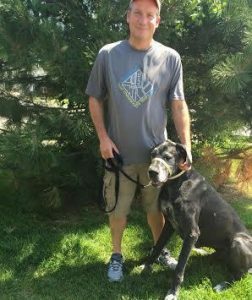 - Rocky Mountain Great Dane Rescue, Inc.
Dante has a home with his new forever family in Windsor, CO. Brad, Karen and their son anxiously applied to adopt with only Dante in mind. The family could not be more ecstatic that this sweet ol’ man will be able to live out his years with them. Dante will have some fur siblings to romp around and play with…A sweet male Dachshund and a female cat. The family enjoys time outside for walks and taking their dogs with them on outings on the weekend. Congratulations Dante!